A[mi]dorable Crochet: Dog Hat Pattern! Cut strips of yarn 22 inches long. Fold in half (you will pull the yarn through at this fold). Insert hook into the middle st on one of your ear flaps. Pull through yarn. Now pull yarn ends through the loop. And tighten. Now braid your tassel, or leave the strands loose. I gave the hats a frilly trim. To do this insert your hook into one of the posts on the last round of your hat. Pull up loop, ch3 and sc in same st. Now sc, ch3, sc in every post around the entire hat, fo. Your trim should look like this. Now weave in all your ends, and your done! Now put it on your little one! haha little Lola was not impressed with me when I snapped this photo. Would this fit a lab? 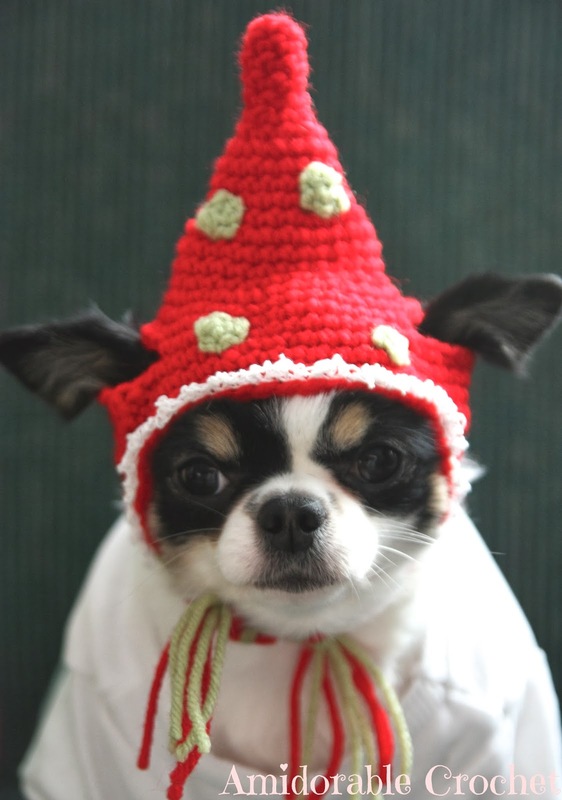 No, I'm sorry this hat was made for a chihuahua so a smaller breed dog. Could you put up a pattern for a hat with a flatter top?? 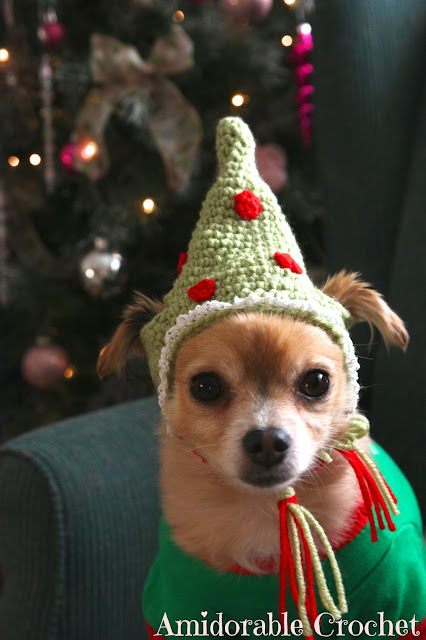 Sorry, I just have the one dog hat pattern right now. Please give measurements for finished hat. I made a red hat and modified it without the earflaps and did the last couple of rows in a fluffy white yarn and now Spike has a Santa hat! I am now working on a sombrero. I made the hat for my Westy. You can find it here..http://dinahcreatief.blogspot.nl/2015/12/kerstmuts-voor-mijn-westie.html Thanks for the pattern. Merry christmas from the Netherlands. 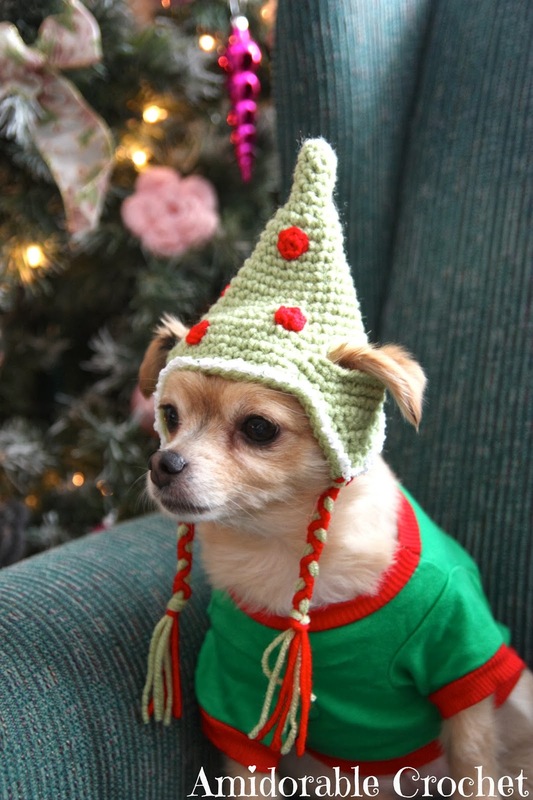 Oh my goodness your little dog hat is so cute, and your little Westy is adorable! Would it be okay if I share your photo on my Facebook page? Thanks! This is super adorable! I am going to attempt this for my two Min Pin girls. Love it. Going to try to amend it to knit since I dont crochet!! How do you add the little bobbles of color? I finished the hat, but that part was missing. Thank you and I love it! Your directions were so clear even for a beginner like me! Hello! Yes, I crocheted little circles and sewed them on after the hat was finished.